The example below shows the game screen on opening. There are 8 individual games to bet on. These are Rainbow, Hi-Lo Numbers, Final Colour, Odd/Even, Final Ball, Lotto, Total, and First Or Last. These are listed on tabs near the top of the game screen. 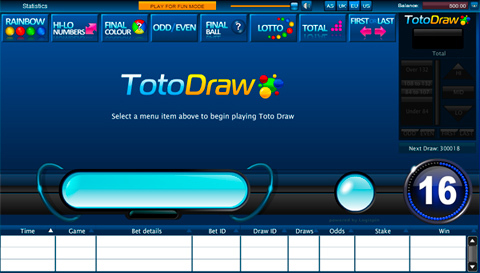 When a customer selects the tab of the game they wish to play, the TotoDraw panel is replaced with the specific features of the game they have chosen. In Rainbow, a customer bets on how many balls of a specific colour will appear in a draw. A winning bet occurs when the number of balls of the colour selected in the bet match the number of balls of that colour in the draw. To make a selection, choose the colour you require by clicking on one of the 3 large balls. Next choose the number of balls of this colour that you believe will be drawn by clicking on either 0, 1, 2, 3, 4, 5, or 6. To change the colour to a different colour, click on the appropriate large coloured ball. To change the number of balls to a different number, click on the appropriate number. To deselect the colour chosen, click on the large highlighted ball again. To deselect the number chosen, click on the number again. Example: I placed a bet specifying that 4 of the 6 balls drawn would be green. The balls below were drawn. As exactly 4 balls drawn were green, my bet was successful. Had the number of green balls in the draw been more or less than 4, my bet would have been unsuccessful. In HI-LO Numbers, a customer bets on the sum of the 6 balls drawn being either high (totalling between 110 and 201), low (totalling between 15 and 106) or in the middle (being 107, 108 or 109). A winning bet is a bet where the sum of the numbers on the 6 balls drawn falls within the range selected in the bet. To make a selection, click on one of the 3 pink indicators; either Hi, Mid or Lo. To change the selection, click on one of the other 2 pink indicators. To deselect the highlighted indicator, click on it again. Example: I placed a bet specifying that the sum of the 6 balls drawn would be low. The balls below were drawn. The total of these balls adds up to 99, so my bet was successful. Had the sum of the 6 balls drawn been more than 106, my bet would have been unsuccessful. In Final Colour, a customer bets on the colour of the last ball drawn. A winning bet is a bet where the colour of the ball selected in the bet matches exactly with the colour of the last ball drawn. To make a selection, click on either the large blue, large green, large yellow or large red ball. To change the selection to a different colour, click on the appropriate large coloured ball. To deselect the colour chosen, click on the large highlighted ball again. Example: I placed a bet specifying that the colour of the last ball drawn would be yellow. The balls below were drawn. As the last ball (number 17) was yellow, my bet was successful. Had the colour of the last ball drawn been red, green or blue, my bet would have been unsuccessful. In Odd/Even, a customer bets on the sum of all 6 balls drawn being an even number where the total can be equally divided by 2, or an odd number where it cannot. A winning bet is a bet where the customer selected Even in the bet and the sum of the balls drawn can be equally divided by 2, or a bet where the customer selected Odd in the bet and the sum of the balls drawn cannot be equally divided by 2. To make a selection, click on one of the 2 pink indicators; either Odd or Even. To change the selection, click on the other pink indicator. To deselect the highlighted indicator, click on it again. Example: I placed a bet specifying that the sum of all 6 balls drawn would be an odd number. The balls below were drawn. The total of these balls adds up to 99 (an odd number), so my bet was successful. Had the total of the balls drawn been an even number (eg 100), my bet would have been unsuccessful. In Final Ball, a customer bets on the number of the last ball drawn. A winning bet is a bet where the value of the ball selected in the bet matches exactly with the value of the last ball drawn. To make a selection, click on the ball showing the number you require. To change the selected ball to a different ball, click on the ball showing your newly required number. To deselect the highlighted ball, click on it again. Example: I placed a bet specifying that the value of the last ball drawn would be 17. The balls below were drawn. As the value of the last ball drawn was 17, my bet was successful. Had the value of the last ball drawn been any number other than 17, my bet would have been unsuccessful. In Lotto, a customer bets on individual balls, selecting up to 4 numbers that they believe will be drawn. A winning bet is a bet where all of the numbers selected appear in the draw. To make a selection, click on up to 4 of the 37 balls displayed. To deselect a highlighted ball, click on it again. To deselect all highlighted balls, click on the Clear button. Example: I placed a bet specifying that numbers 16, 27, 28 & 17 would be drawn. The balls below were drawn. As the four numbers specified were drawn, my bet was successful. Had all 4 of the numbers specified in my bet not been drawn, my bet would have been unsuccessful. If numbers 16, 28 & 17 been drawn but number 27 had not, my bet would have been unsuccessful. In Total, a customer bets on the sum of all 6 balls drawn being within one of four ranges. These are under 84, between 84 and 107, between 108 and 132, and over 132. A winning bet is a bet where the sum of the numbers on the 6 balls drawn falls within the range selected in the bet. To make a selection, click on one of the 4 pink indicators; either Under 84, 84 to 107, 108 to 132 or Over 132. To change the selection, click on one of the other 3 pink indicators. To deselect the highlighted indicator, click on it again. Example: I placed a bet specifying that the sum of all 6 balls drawn would be between 84 and 107. The balls below were drawn. As the total of these balls is 99, my bet was successful. Had the total of the 6 balls drawn been under 84 or above 107, my bet would have been unsuccessful. In First Or Last, a customer bets on which of 2 balls drawn (the first or last) will have a higher value. A winning bet is a bet where the customer selected First in the bet and the value of the first ball drawn was higher than the value of the last ball drawn, or a bet where the customer selected Last in the bet and the value of the last ball drawn was higher than the value of the first ball drawn. To make a selection, click on either the pink ball on the left or the pink ball on the right. Selecting the left pink ball would indicate that the first ball drawn will have a higher value than the last ball drawn. Selecting the right pink ball would indicate that the last ball drawn will have a higher value than the first ball drawn. To change the selected ball, click on the other pink ball. To deselect the highlighted ball, click on it again. Example: I placed a Last bet specifying that the value of the last ball drawn would be higher than the value of the first ball drawn. The balls below were drawn. As 17 is higher than 16, my bet was successful. Had the last ball drawn had a value of 15 or below, my bet would have been unsuccessful.